The Curbside Cafe in Vista, Ca - Great Food. Come say "Hello" to chef / owner, John Randall. 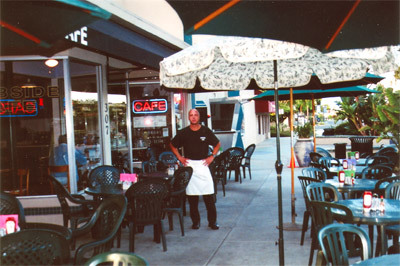 John has worked in the Restaurant Business for over 30 years. Originally from the east coast and a graduate of The Culinary Institute of America, he has worked for 5 star resorts, country clubs, various restaurants and hotels. He has experience in every aspect of restaurant work including chef, server, bartender, busboy and dishwasher. "I just wanted to take a few nice touches and put them into a simple café. and create a cozy, comfortable, friendly atmosphere." located at 307 Main Street in Vista, Ca. Read more about John and the Curbside Cafe. John always uses top quality ingredients and spends a lot of time shopping in local markets, buying fresh, seasonal products. Curside Cafe's entrees range from $8.00 to $11.00. We offer specialty coffees, blended ice coffees, smoothies, beer, and wine. John created a menu that offers a nice range of selections. Some of our more popular breakfast items or choice New York steak and eggs, huevos rancheros, stuffed croissant, tofu vegetable scramble, crabcake benedict, smoked salmon scramble and a nice variety of omeletts. For lunch, Curbside Cafe offers fresh soup of the day, clam chowder, crabcakes, coconut shrimp and vegetable quesadillas for starters. A selection of wraps and hearty sandwiches such as swordfish, monte cristo, crabcake, mixed sausage, melts, a nice selection of chicken sandwiches and hamburgers and different kinds of entree salads with a choice of chicken, shrimp, swordfish, and salmon. But the most addicting item on the menu is John's Homemade Cinnamon Rolls that melt in your mouth.